My relationship with musicals is, overall, a little complicated. The exceptionally vibrant attitudes, the bubbly dialogue, and the unnatural introduction of songs into everyday activities might be common criticisms lobbed at the genre, but they're also what hold me back from embracing more of those productions. That just makes the few that I do latch onto feel special, though, from Singin' In the Rain and Disney animated films to Sweeney Todd and Les Miserables -- and, of course, Jacques Demy's The Umbrellas of Cherbourg -- and it often comes down to whether the subject matter has a certain type of bold emotionality and relatability that transcends its genre: tales of poverty, political discord, vengeance, the struggles of the creative process, or tragic love. It was surprising, then, to find myself not joining in on the adoration showered upon Whiplash director Damien Chazelle's La La Land. It's another piece of work centered on struggling, romantically-entangled artists in Hollywood that many had deemed to be "one of those musicals for non-musical people", but one in which the interjection and extended presence of musical elements hits that familiar unnatural note, and where the roadblocks encountered by the jazz musician and burgeoning actress on their way to success revolves around self-satisfied showbiz nostalgia. Chazelle was heavily influenced by Jacques Demy in his creation of La La Land, specifically and quite observably by The Umbrellas of Cherbourg, a different sort of tale about an in-love couple being separated by time and space. The story of Genevieve (Catherine Deneuve), a young clerk at her mother's (Anne Vernor) struggling umbrella shop, and Guy (Nino Castelnuovo), a mechanic who recently became of age to be drafted into the military, follows a different path than that of the recent Oscar contender by focusing on turns of events that aren't universally relatable, hinged on France's mandatory conscription of young men into military service during the late-'50s. 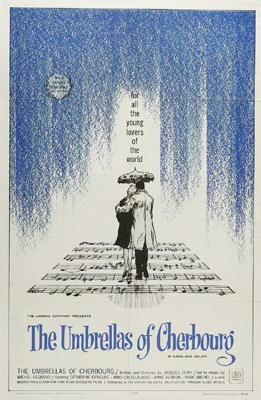 Despite how this conflict dates the film and creates a barrier for those who haven't had to deal with the perils of military/wartime romance, there's a tenderness to the relationship and a bittersweet unfolding of the course of events in The Umbrellas of Cherbourg that allows Demy's musical to endure and appeal to broader audiences -- even those outside the musical genre -- due to the genuineness of its sentiments and the risks taken involving poverty, obligation, and disenchantment. Of course, Demy's film doesn't wallow in those somber underpinnings with its cinematic presence. 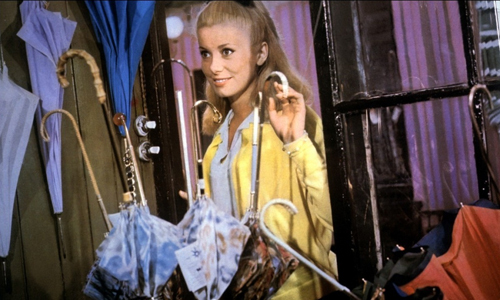 The Umbrellas of Cherbourg boasts bright, lovely shades of color that lace throughout the titular coastal city almost like streaks found in pieces of fancy ribbon candy, dominating the walls and décor of the umbrella business and spilling out into the bars and other businesses around it. Pastels, pinks, and other insistent palette confections obviously command one's attention, yet it's the sneaky bursts of color tucked away in little spaces that give Genevieve and Guy's gallivanting through the city its charm, from rich expressive greens on textured walls to an abstractly-painted fuchsia and purple wall seen through iron gates. Demy captures a gradient of moods in his visual choices, yet they're not so blatant that they're easily deciphered, where blues only convey sadness and red only convey passion or warning. He holds the audience's interest with aesthetic playfulness, giving them expressive flavors to enjoy without being told what the colors indicate, if they indicate anything beyond how the color makes a viewer feel. There isn't a moment in The Umbrellas of Cherbourg where dialogue isn't delivered through song or without a kind of choral inflection. For some, this might take a little getting used to since there aren't any breaks between musical numbers for "normal" drama, conveying the gradient of emotions going on around Genevieve and Guy -- devotion, insecurity, frustration -- through a combo of lyrics, vocal tones, and overt body language. Gradually, Demy casts a spell with his combination of lavish colors and constant delivery of music, where the fluently sung dialogue comes across as second nature in his take on ‘50s and ‘60s France, ever presenting a feast for the eyes and ears. More pertinently to this discussion, this locked-in illusion of musical conversation bypasses the entrance and exit of musical numbers in everyday situations since, well, the whole thing's essentially a song, never interrupting moments of romance or family discord between Genevieve and her cynical, pragmatic mother. Questionable transitions from spoken drama to musical drama aren't a concern here. While the choral performances are dubbed over by other French singers, the dramatic performances are entirely of the actors' making, center of them all being the vacillating, increasingly solemn presence of Catherine Deneuve. For an element that could create a profound disconnect if not delivered right, Demy bridges that gap by pulling tender, entirely genuine performances from both Deneuve and Nino Castelnuovo as Guy, crafting a pair of lovebirds posed with a challenging life decision -- whether to break apart or stay together during Guy's enlistment -- that takes on a wide gamut of emotions while they figure out their situation. A charming synergy forms between them through their impeccable facial and body expressions moving in tandem with Demy's intuitive and evenhanded script, hinged on devotion, insecurity, and frustration as they grow closer and cope with the repercussions of their choices. Deneuve commands the breadth of the film's attention, though; the flush of her cheeks and the lamentation in her slumping poise effortlessly deepens one's empathy for her emotional state. 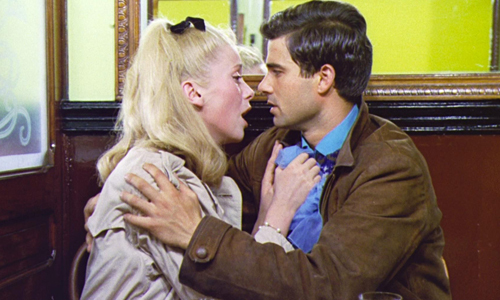 The Umbrellas of Cherbourg transpires across three stretches of time in the young couple life, or lives, spanning several years and showcasing how distance apart from another changed them as individuals. What sets Jacques Demy's depiction of their long-distance woes apart from similar stories, similar decorated and well-regarded musicals, can be observed in the ways that the couple adapts, bends, and breaks to the everyday woes of their life's challenges, how Genevieve handles the prospect of a more comfortable life with a wealthy suitor -- whom her mother favors -- and how Guy copes with returning home from his service. These themes aren't restricted by the moving parts of the film's conceit; instead, they tap into relatable ideas that reflect upon the experiences of anyone who has weighed the pros and cons of momentous decisions in their lives, who has grappled with the controlling suggestions of their parents, and who has endured the rigors of long-distance relationships of many types. With The Umbrellas of Cherbourg, Demy displays spellbinding artistic playfulness and expressive nuance, while striving to be aware enough with its perspective on everyday people that it shouldn't leave anyone out in the cold.